The new iPad 2 is now 33% thinner and up to 15% lighter. It has a Dual-core A5 chip. Two powerful cores and faster graphics mean better surfing, better watching, better gaming, better everything. All with the same 10 hours of battery life (which sadly wasn’t improved). 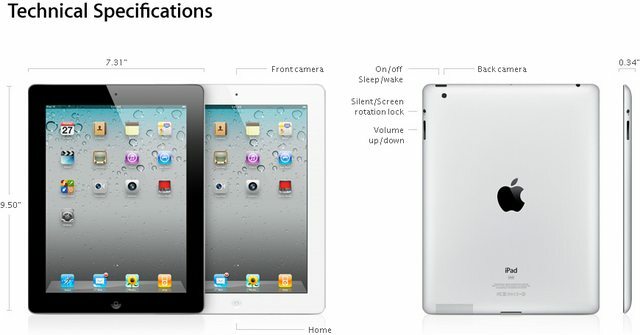 iPad 2 also comes with 2 cameras: Facetime, HD video recording, photos with Photo Booth. It has Wi-Fi (802.11a/b/g/n) and Bluetooth 2.1 + EDR technology. 9.7-inch (diagonal) LED-backlit glossy widescreen Multi-Touch. 1024-by-768-pixel resolution at 132 pixels per inch (ppi). Fingerprint-resistant oleophobic coating. iPad Smart Cover: It attaches magnetically and aligns perfectly. Open and close it, and iPad 2 wakes up and goes to sleep. Fold it into a stand for watching and typing. It’s smart in more ways than one. Contrary to the rumors, the new iPad 2 has been improved a lot internally. Faster processor, faster graphics, HDMI Full HD output, the 720p HD camera on the back, the frontal VGA camera. Dual-core 1GHz A5 processor, which is “up to two times faster” than the previous version, Steve says. The graphics have been improved too. The GPU goes at 9 times the speed as before. Same low power consumption as the A4. Built-in cameras for photos and video. The cameras support the same exposure and focus control as the iPhones: Just tap where you want to focus for video and stills photography. Sensors: Three-axis gyroscope (great for innovative Apps), Accelerometer, Ambient light sensor. The 25-watt battery’s life is 10 hours on Wi-Fi, watching video, or listening to music. Up to 9 hours of surfing the web using 3G data network. Just like before, but in a much thinner package. And one month stand-by time. Input / Output: 30-pin dock connector port, 3.5-mm stereo headphone minijack, built-in speaker, microphone, Micro-SIM card tray (Wi-Fi + 3G model). The screen hasn’t changed, it still is 9.7-inch with same resolution, 1024 x 768-pixel IPS display. There is no better pixel density. The mic records Mono audio. The Wi-Fi model still lacks a GPS, it uses Wi-Fi location services. The 3G model has Assisted GPS. No Flash (camera). It uses its backside illumination sensor improving by software the low light photos. No Flash for the Internet browsing. It is far from being the 5 Megapixels of the iPhone 4, like the iPod Touch 4G, it recrods 720p HD video but takes 0.7 Megapixel photos. 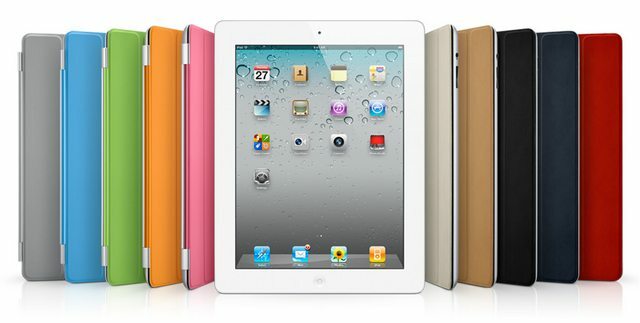 The new iPad 2 comes in color white and looks GREAT!!!! I love it. It is Thinner than the iPhone 4 and 33% thinner than the current iPad. That’s going from 13.4mm (more than a centimeter) to 8.8 millimeters (0.34 inches). For reference, the iPhone 4 is 9.3 millimeters. The weight is going down too: From 1.5 pounds to 1.3 pounds. It will be available on March 11 (black and white models) to the US, and the 3G model will be available on both AT&T and Verizon networks. Internationally, the intro date will be March 25 in 26 countries, including Australia, Canada, France, Germany, Japan and UK. The prices will remain the same across the line. The Wi-Fi model will come for $499, $599, and $699 for the 16, 32 and 64GB models. The 3G takes that to $629, $729, and $829. In the Box: iPad, Dock Connector to USB Cable, 10W USB Power Adapter, Documentation. They come in Polyurethane and Leather. They connect with the iPad using built-in magnets from the iPad’s frame. The iPad Camera Connection Kit gives you two ways to import photos and videos from a digital camera: using your camera’s USB cable or directly from an SD card. iPad supports standard photo formats, including JPEG and RAW. So you can get photos off your camera and onto a more picture-friendly display, moments after you take them.